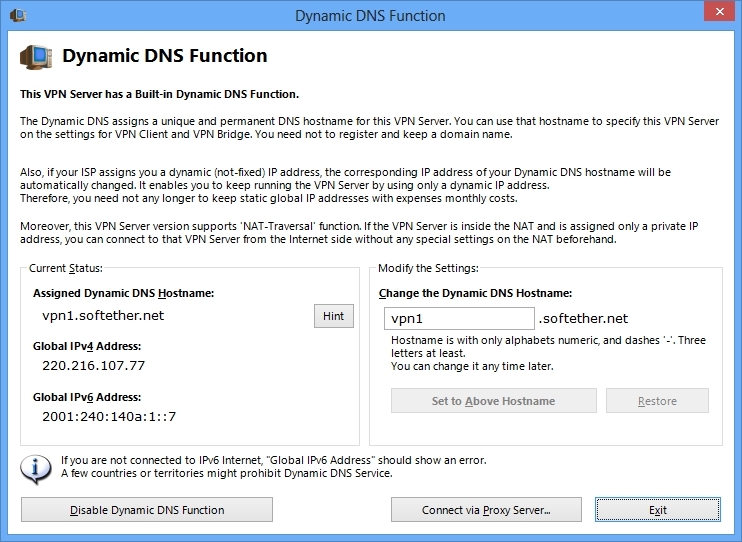 The softether.net Dynamic DNS Service is a Dynamic DNS (DDNS) service. The service is provided by SoftEther Project, University of Tsukuba, Japan since March 8, 2013 for academic purpose. This service allows anyone to register a unique hostname to the "softether.net" domain with associated IPv4 and IPv6 address. This service is free of charge and is provided without warranty of any kind. he softether.net Dynamic DNS Service is designed to use with SoftEther VPN Server, an open-source free cross-platform multi-protocol VPN server. The Dynamic DNS Client is built-in in the SoftEther VPN Server service. The Dynamic DNS function assigns a world-wide unique identifier on your SoftEther VPN Server. Your global IP address of SoftEther VPN Server will follow dynamic IP address changes. If the IP address of SoftEther VPN Server suddenly changed, the IP address record which is registered to the Dynamic DNS hostname changes automatically and immediately. A VPN client user can specify the Dynamic DNS hostname as the destination VPN Server's hostname instead of the IP address. VPN Clients and VPN Bridges can keep stable connections to your SoftEther VPN Server even if the server-side Internet connection is not a static IP address contracts. For more details, please refer 1.4. Built-in Dynamic DNS (*.softether.net). The Dynamic DNS function easy-setup screen. We provides the Dynamic DNS service as an academic experiment. Therefore, there services can be used for free of charge. These services are not parts any commercial products. These services are provided without any warranty. The services may be suspended or discontinued by technical or operational matters. In such occasions, users will not be able to use the services. A user has to understand such risks, and to acknowledge that such risks are borne by a user-self. SoftEther Project will never be liable to results or damages of use or unable-to-use of the service. Since the softether.net DDNS service is open for everyone, anyone can register any IPv4 address or IPv6 address to the softether.net domain, and we make efforts to keep the registered records correctly without any intervention. In principle, we do not delete or modify registered hostnames or IP addresses. However, we have the right to delete any "malicious" hostnames from the softether.net domain at any time. Additionally, we have the right to reject further registration requests from specified IP addresses or users who are marked as malicious users by our decisions. Any kind of servers which are hosted on the IP address, which is associated to a DDNS hostname in the softether.net domain, is performing any kind of illegal activities. We will execute our right to delete or modify the registered DDNS hostname after we confirm the fact that the hostname is abused, or after the fact is be reported from authorities to us. If you find any "malicious" hostnames registered on the softether.net DDNS domain name, please kindly report us about the facts by using the following form. We will respond as soon as possible (in two business days in average). Tennoudai 1-1-1, Tsukuba, Ibaraki, Japan 305-8573. The number of registered hostnames on the softether.net DDNS service is as following. THE SERVICE IS PROVIDED "AS IS", WITHOUT WARRANTY OF ANY KIND, EXPRESS OR IMPLIED, INCLUDING BUT NOT LIMITED TO THE WARRANTIES OF MERCHANTABILITY, FITNESS FOR A PARTICULAR PURPOSE AND NONINFRINGEMENT. IN NO EVENT SHALL THE AUTHORS OR COPYRIGHT HOLDERS BE LIABLE FOR ANY CLAIM, DAMAGES OR OTHER LIABILITY, WHETHER IN AN ACTION OF CONTRACT, TORT OR OTHERWISE, ARISING FROM, OUT OF OR IN CONNECTION WITH THE SERVICE OR THE USE OR OTHER DEALINGS IN THE SERVICE. THIS SERVICE IS DEVELOPED IN JAPAN, AND DISTRIBUTED FROM JAPAN, UNDER JAPANESE LAWS. YOU MUST AGREE IN ADVANCE TO USE, COPY, MODIFY, MERGE, PUBLISH, DISTRIBUTE, SUBLICENSE, AND/OR SELL COPIES OF THIS SERVICE, THAT ANY JURIDICAL DISPUTES WHICH ARE CONCERNED TO THIS SERVICE OR ITS CONTENTS, AGAINST US (SOFTETHER PROJECT, SOFTETHER CORPORATION, DAIYUU NOBORI OR OTHER SUPPLIERS), OR ANY JURIDICAL DISPUTES AGAINST US WHICH ARE CAUSED BY ANY KIND OF USING, COPYING, MODIFYING, MERGING, PUBLISHING, DISTRIBUTING, SUBLICENSING, AND/OR SELLING COPIES OF THIS SERVICE SHALL BE REGARDED AS BE CONSTRUED AND CONTROLLED BY JAPANESE LAWS, AND YOU MUST FURTHER CONSENT TO EXCLUSIVE JURISDICTION AND VENUE IN THE COURTS SITTING IN TOKYO, JAPAN. YOU MUST WAIVE ALL DEFENSES OF LACK OF PERSONAL JURISDICTION AND FORUM NON CONVENIENS. PROCESS MAY BE SERVED ON EITHER PARTY IN THE MANNER AUTHORIZED BY APPLICABLE LAW OR COURT RULE. 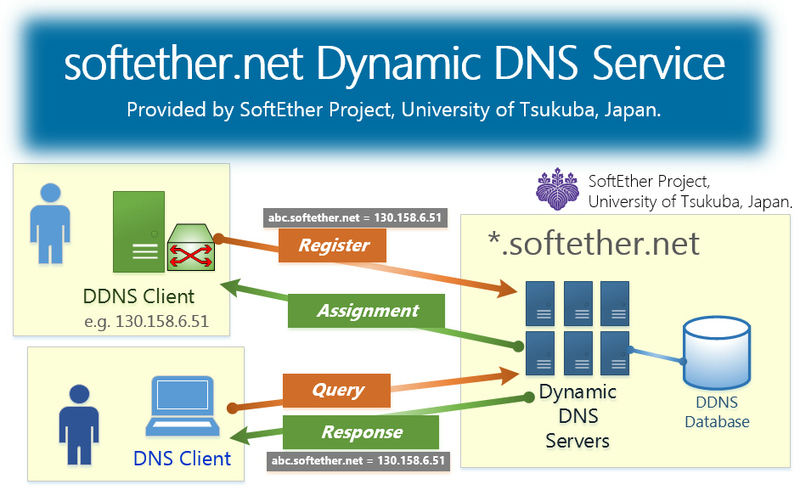 softether.net Dynamic DNS Service by SoftEther Project at University of Tsukuba, Japan. Copyright © 2012-2019 SoftEther Project at University of Tsukuba, Japan. All Rights Reserved. softether.net DDNS servers are hosted at Academic Computing & Communications Center, University of Tsukuba, Japan.